Marketing Information: The Allied Telesis x930 Series of stackable Gigabit Layer 3 switches provide resiliency, reliability and high performance, making them ideal for distribution and network core solutions. 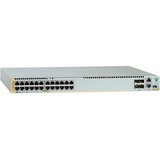 Allied Telesis x930 Series switches are a high-performing and feature-rich choice for today's networks. With a choice of 24- and 48-port models with 10Gigabit uplink ports, plus the power of Allied Telesis Virtual Chassis Stacking (VCStack™) with up to 160Gbps of stacking bandwidth per switch, the x930 Series have the flexibility and performance for key network connectivity. The convergence of network servicesin the enterprise has led to increasing demand for highly available networks with minimal downtime. VCStack, in conjunction with link aggregation, provides a network with no single point of failure and an easy, resilient solution for high availability applications. The addition of Ethernet Protection Switched Ring (EPSRingTM) resilient ring protocol ensures distributed network segments have high-speed, resilient access to online resources and applications. The x930 Series ensures a futureproof network, with superior flexibility coupled with the ability to stack multiple units. All x930 Series models feature 10 Gigabit and the option of 40 Gigabit uplinks ports and a comprehensive IPv6 feature set, to ensure they are ready for future network traffic demands. All x930 Series switches are Software Defined Networking (SDN) ready and will support OpenFlow v1.3 in the near future.